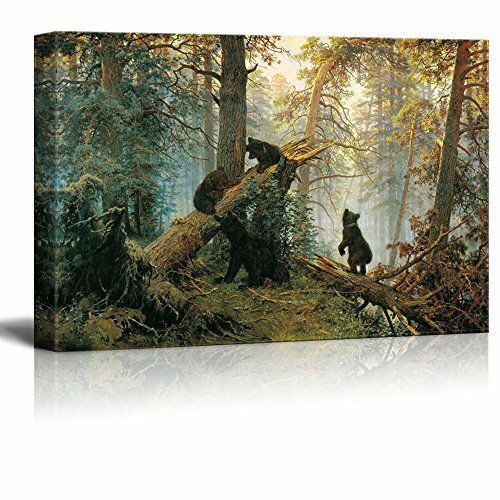 wall26 - Black Bears in Forest Painting - Canvas Art Wall Decor - 32"x48"
Great picture, I ordered the 2nd to smallest i believe it is about a 16x24. Works great for the space. This product is exactly what I hoped for!! It's such a beautiful canvas print, and I am so happy with it! I've ordered canvas prints in the past from other sellers, and those didn't turn out well, but this one is perfect! If I ever get another canvas print, I will be ordering from this seller. We were very pleased with the picture and received many compliments on it. We hung it above the fireplace so it was one of the first things people saw when they entered our home. We had no problems hanging it, because it was lightweight. I love this print. The colors are soft, yet distinct. This item is as described. Okay print but I really expected a bit better. The canvas is not stretched and there is a noticeable wrinkle. Would have rather it been real wood like the pictures and not compressed board. Like I said, it’s okay. Without the wrinkle I’d probably be a lot happier. Love the colors! Looks beautiful in my living room. I bought this for housewarming gift (perfect since it is Fall) ?? They absolutely loved it ! It looks just like the picture...a foggy, peaceful Fall Morning.